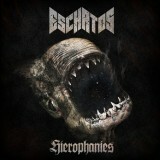 Short but sweet, this début album from Latvian newcomers Eschatos is well worth your ears. Playing a distinct form of modern black metal with a strong vein of prog running in their veins, Eschatos are quite a new band, having only being formed last year, but the members' experience in other groups is apparent from the skill shown here. Somewhat like a blacker Opeth and a more straightforward Enslaved, the band has the band has one male and one female vocalist, but not used in the stereotypical harsh/light manner – the roles are reversed, Kristiāna having a harsh Grutle Kjellson-style snarl and guitarist Hellhurl Caligula providing the soulful clean singing. Together they form a compelling duo, lifting the atmospheric value considerably and showing the band are great whether it's at headbangable riffage or proggy melodic interlude. After brief yet atmospheric interlude Into Coherent Void, first track proper One that Divides the Time slowly begins with ominous gothic riffs, soon kicking up a gear into galloping riff-driven black metal. Quickly proving its prog credentials by smoothly switching first to folky riffs then to doom, the track builds up to a strange droning peak, with Kristiāna chanting wildly. The following ten-minuter Crusaders of Sodom begins in a thrashier style, but again builds up at around the halfway mark to an epic duet between the two vocalists. A lengthy instrumental section shows the guitarists' skills off well, but it does drag slightly and seem slightly directionless, as enjoyable as it is. Brief piano interlude Hierophanies acts as a breather before finale Erset la Tarie, probably the most black metal track present with militaristic drum battering and Kristiāna at her hoarsest and nastiest. After some nicely atmospheric soloing, it closes on eerie echoing guitar wails, leaving you wanting more. Obviously as a debut release Hierophanies is very impressive. It's a little rough around the edges, and a little more work needs to be done on the songwriting front, but given a chance to polish their sound Eschatos will be a band to reckon with. You can hear this in full at the Bandcamp link above, available to download name-your-price.